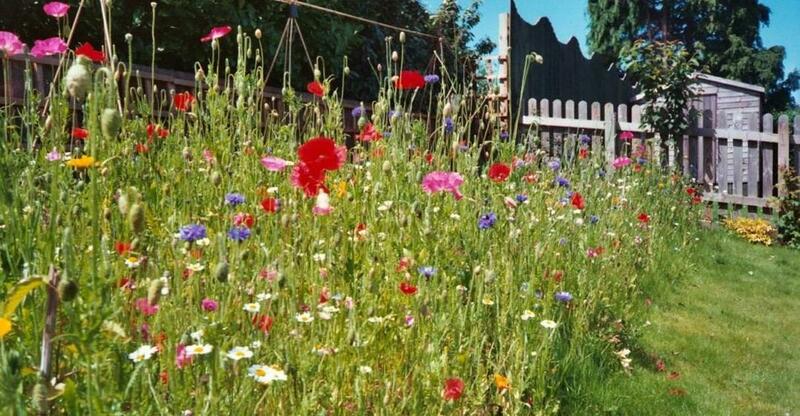 Using Wildflower turf is the most successful way of creating a wildflower meadow in your garden. Soil preparation is exactly the same as if you were going to sow a wildflower meadow from seed but wildflower turf has the advantage of providing an instant wildflower oasis with a 100% success rate in comparison with a 30% success rate when seeding. For success when turfing a wildflower meadow it is vitally important that the area to be turfed must be totally free of weeds and grass prior to turfing to reduce unwanted competition from perennial weeds such as dandelions, docks, ground elder which might try to grow up through the turf as it establishes. The area to be turfed should be lightly cultivated to create a fine seed bed. Deep cultivation is not necessary and might increase the risk of disturbing dormant weed seeds. 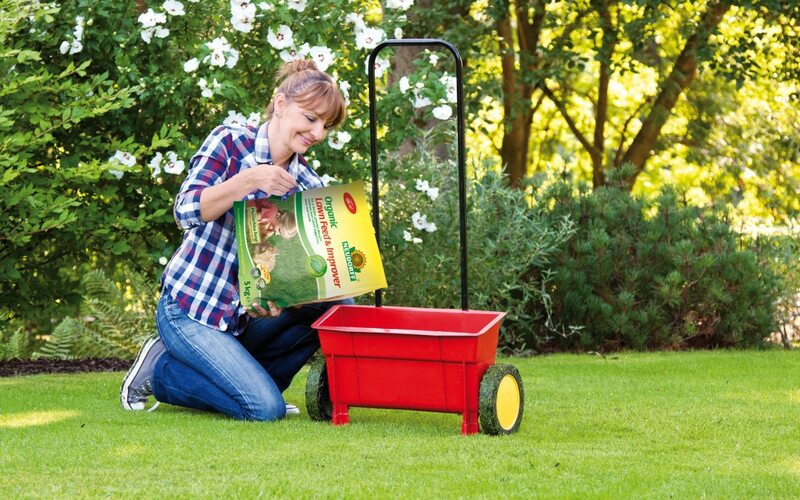 Cultivation can be carried out using a rotavator or tiller and the seed bed should be raked down to a fine smooth tilth using a metal soil rake removing large stones or other unwanted debris. The turf will be delivered on a pallet in rolls or slabs depending on the time of year. It is crucial to lay the turf within 24 hours of delivery as the turf will quickly deteriorate if left on the pallet. 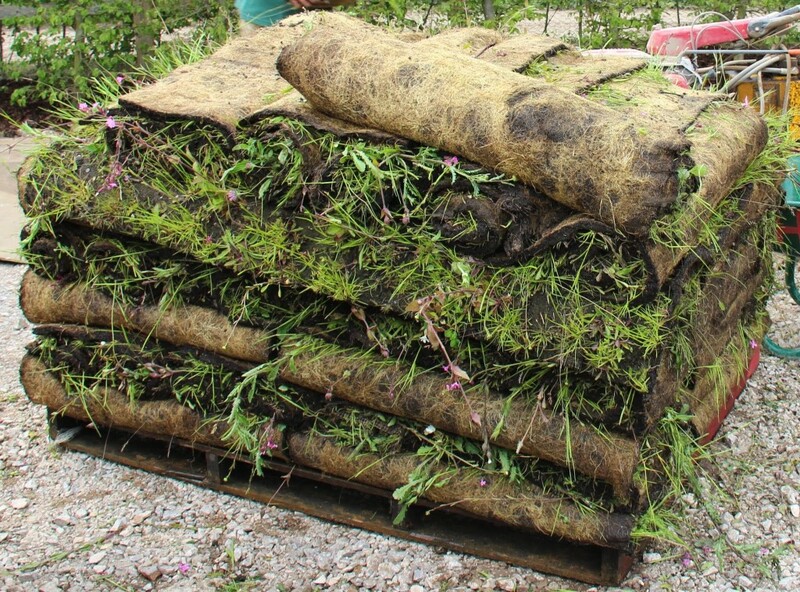 If you are not ready to lay the turf, remove it from the pallet, unroll and keep watered. 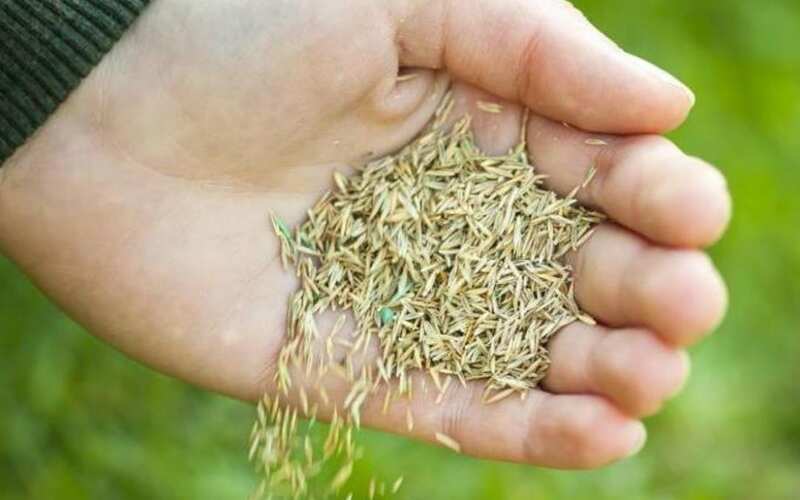 The amount of growth on your wildflower turf will depend on the time of year and how mature the turf is, this could vary from half an inch long to eight inches long. Lay the wildflower turf just as you would with regular lawn turf, in staggered rows and abutting the joints. Water immediately to prevent the turf from drying out. Any wildflowers which have been flattened by being rolled up will soon perk up within a few days. 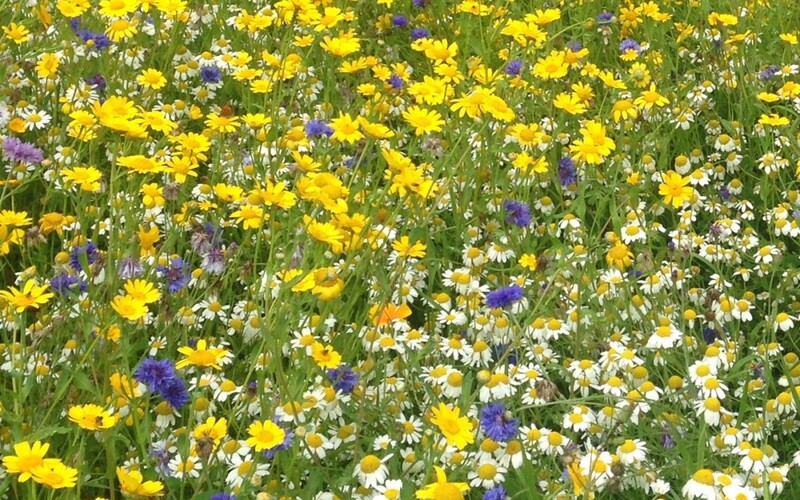 Hewlett Turf & Landscapes Ltd are experts in the supply and lay of Wild Flower Turf. Once laid, water the turf thoroughly for the first week if the weather is dry. If the soil is not soaked before laying, it is important to check that this initial watering soaks through to the soil beneath the turf. During this watering, check by lifting a corner of the turf to ensure that the soil is damp. 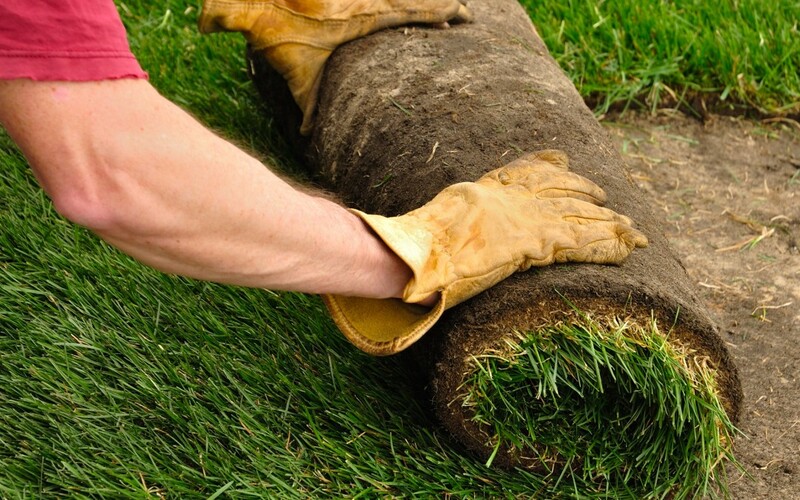 Do not allow the turf to dry out before it establishes and is rooted – roughly two to four weeks. For the first growing season, it is important to water the turf occasionally during extended dry spells. Once well established, the wildflower turf will cope well with most circumstances but the flowers will benefit from watering during very dry periods. Never apply fertiliser to wildflower turf. Mowing of your wild flower meadow can be carried out with a heavy duty mower or strimmer/brush cutter. It is vitally important that the cuttings are always removed. Most people tend to cut down the meadow once per year during the autumn but some prefer to also make an interim cut during the summer. If the soil is fertile, or the growing season is especially good, this can result in very strong growth which will eventually cause lodging (falling over) and looking untidy in the summer. In this case, the management regime can be modified where an additional cut in summer can be introduced. Cutting at this time reduces the grasses’ vigour, results in a shorter sward and a later flowering. An open sward over the winter ensures healthy, disease free plants which can benefit from what light is available to them over the winter months. As spring approaches, the wildflowers and grasses are in the perfect condition to develop flowers and seed heads quickly and to repeat their perennial cycle thus guaranteeing a wildflower meadow year after year.